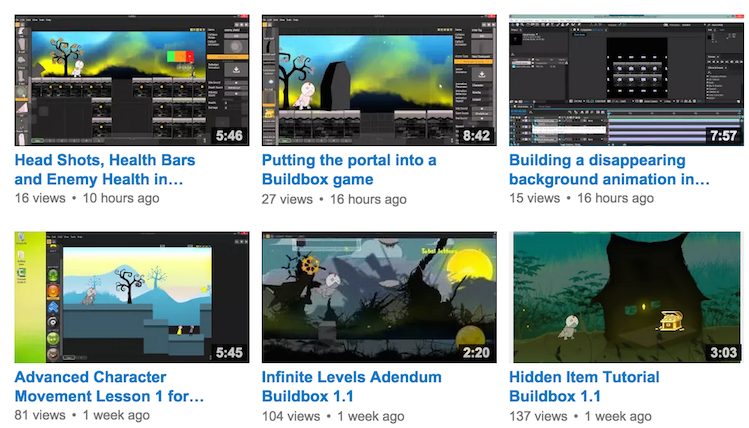 Looking for more video tutorials for Buildbox? Checkout this Youtube Channel. It’s run by Justice Frangipane who we’ve been watching for a while. He setup LearnBuildbox.com and has created some really great tutorial videos on topics like advanced character movement, using hidden items, creating portals, making health bars and more. Hello, please tell me I have alrady build a game..itc on maadc.itch.io and how to insert on website, so it can be played in browser? Buildbox does not support browser based export, unfortunately. Im using the 15 days trial.. If my game is complete can i post in the appstore? Wouldnt that be a bit risky not having it checked on a actual iphone first? Please help ..
Hi Manuel, only Mac OSX, Amazon, and Windows export are supported in 15 day challenge. If you wish to export to Android or iOS a purchase is needed. The 15 day business challenge is primarily to test the software, not the exporting/compiling process. We apologize for any inconvenience. sorry for bothering but I just want to be sure. Hi Maxim, After you’ve downloaded the art pack, you can place it wherever you’d like to unzip it and then drag and drop the pictures and animations into Buildbox. What happens if apple comes up with iOS 9 ?, 10 ? what then ? would you upgrade and give the upgrade for free ? in order to justify this price, why can’t we try the games that we make during the 30 days on mobile ? Hi, we plan to support future export options with Buildbox in regards to new updates when necessary. You can certainly make more than endless runners using buildbox for sure. If you’d like we can direct you to some games in the app store. In regards to supporting the 15 day challenge on mobile we do but only for Amazon format. Only Mac OSX, Amazon, and Windows export are supported in 15 day challenge. If you wish to export to Android or iOS a purchase is needed. The 15 day business challenge is primarily to test the software, not the exporting/compiling process. We apologize for any inconvenience. The 15 day trial software doesn’t allow to export to android and IOS, it is disabled, you should put that info in your trial page. I downloaded BuildBox, but I don’t had a “Buildbox Art” folder anywhere. Do I download that elsewhere? Hi Daniel, yes you have to download the Buildbox Art Pack. It’s located on the Day 1 Page of the 15 Day Challenge.